Micro Matrix Systems' facilities include Nilson fourslide machines built specifically for light gauge stampings. Our fourslide machines range from 00’s, 700’s, 751's and 0 combinations for wire and thin gauge metal forming. 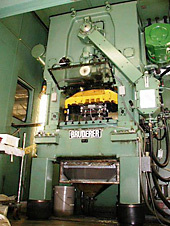 High Speed Presses MMS utilizes Bruderer, Minster and Ing Yu high speed precision stamping presses for close tolerance high speed stamping and bandoliering of custom components to our customers' exacting specifications. Our press speeds range from 150 to 1,500 SPM. Tonnage includes 30 and 45 ton machines.